Given the tremendous responsibility and decision-making power of boards, and the length of most board members’ tenures, making sure you have the right composition of leaders on your board is absolutely fundamental. As any effective leader knows, making sure you have the right people on your team is absolutely fundamental. 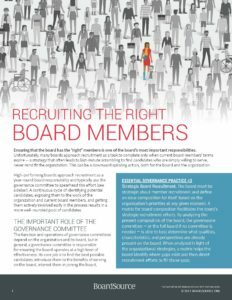 For boards, this is no less important, particularly given the tremendous responsibility and decision-making power that boards have, and the length of most board members’ tenures. There’s no question about it: Without the right people around the table, it is difficult for any board to provide effective leadership. 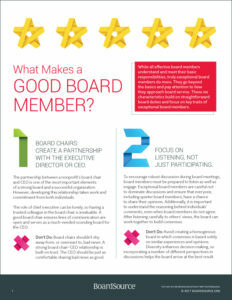 So what does it take to build and maintain a strong and effective board? 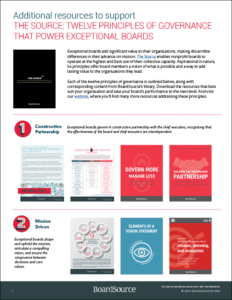 According to Leading with Intent, the most successful boards are thoughtfully composed as it relates to skill sets, leadership styles, and diversity of thought and background. 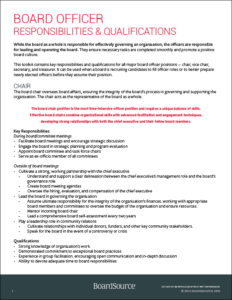 They understand the leadership needs of their organizations and seek out board leaders who can bring the expertise, passion, and external leadership that they need both now and into the future. 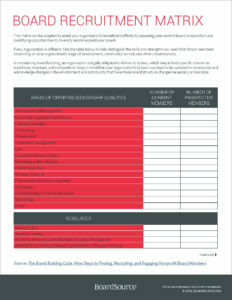 For many boards, that starts with a board matrix — an inventory of the perspectives, skill sets, and leadership characteristics that are needed for the board overall, and where there are — or will be — gaps, based on the board’s current composition. This inventory includes having a thoughtful discussion of whether or not the board reflects the diversity of the community it serves and, if not, the signal that sends to the external world about who your organization is and what it values. 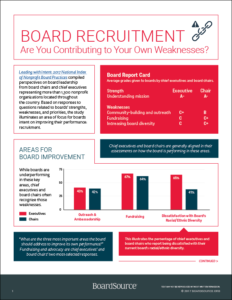 BoardSource cautions boards, however, from using a “checklist” approach to board recruitment, especially when it comes to board diversity. No board candidate should be reduced to a demographic profile, and boards are wise to think about holistic and multi-faceted leadership profiles that value diversity within the context of other stated leadership needs. Visit the Board Recruitment Center for more resources. 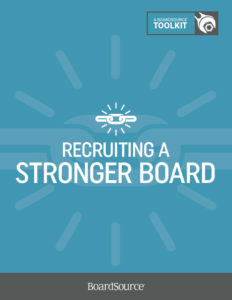 Board Recruitment: Are you Focused on the Right Things? All 101-level topical resources listed below are available publicly. 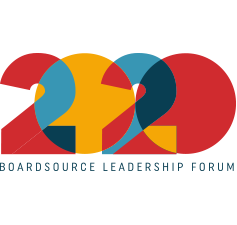 BoardSource members have access to 101, 201, and 301- level resources. Don’t forget to visit the BoardSource store or the Board Recruitment Center for more resources and training on this topic. 101| Community resource. Exceptional nonprofit boards recognize that diversity is essential to an organization’s success. They see the correlation between mission, strategy, and board composition and understand that establishing an inclusive organization starts with establishing a diverse and inclusive board. 101| Community resource. As the highest leadership body of the organization and to satisfy its fiduciary duties, the board is responsible for the following. 101| Community resource. Having an organized board recruitment process in place not only makes it possible to fill vacancies on a board in an effective and speedy manner, but it creates a foundation for building a skillful and diverse board. It allows the organization to cultivate potential candidates and to prepare them to join the board when the time is right. 201| Members only resource. Numerous organizations are interested in having celebrities serve on their boards to raise the organization’s profile and expand its recognition. Many celebrities are active in charitable work and extend their names, money, and time to further the work of these nonprofits. Serving on the board, however, is a different issue. 201| Members only resource. A common complaint of those in nonprofit organizations is the difficulty in finding effective trustees/board members. Once potential candidates are identified, they must be properly vetted and then convinced to serve. 201| Members only resource. It is natural for those receiving services from a nonprofit — or their family members — to want to serve on the board in order to influence how the organization functions. There hardly is a more direct way to shape the focus of the organization. Neither is it rare for a nonprofit to recruit customers, consumers, or their family members as board members to ensure that their perspectives are included in the decision-making process. There are clear benefits but also caveats in this interaction, however. Does Board Size Really Matter? 301| Members only resource. 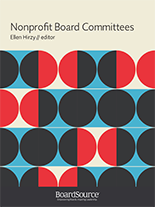 Every nonprofit needs a board, but — as we look at the various boards in various organizations (close to 1.9 million tax-exempt nonprofits) — it is astonishing how different they appear. It is possible to find a board with only one member and the largest ones might have more than 100 members. There are numerous reasons for this variety, so it seems perfectly reasonable to ask, why size remains, if not a controversial, at least a rather complicated issue. 101| Community resource. 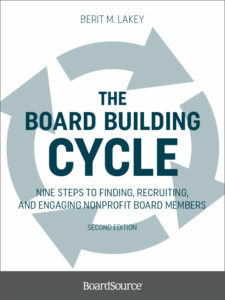 The first challenge for a founder of a new nonprofit organization is to build a board. This entails recruiting committed and resourceful volunteer board members, organizing the first board meeting, and, most importantly, guiding the new board on its roles and responsibilities, which includes fine-tuning the mission, setting the guidelines for effective governance, and helping develop strategies. 201| Members only resource. 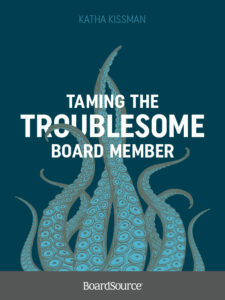 Many boards struggle when a valuable board member’s term is up and it seems a waste to let him or her fade into the distance. The board member’s experience and insight could still benefit the organization but the bylaws don’t include a structured way to make this happen. Here are some ideas for showing appreciation for former board members’ service. 101| Community Resource. 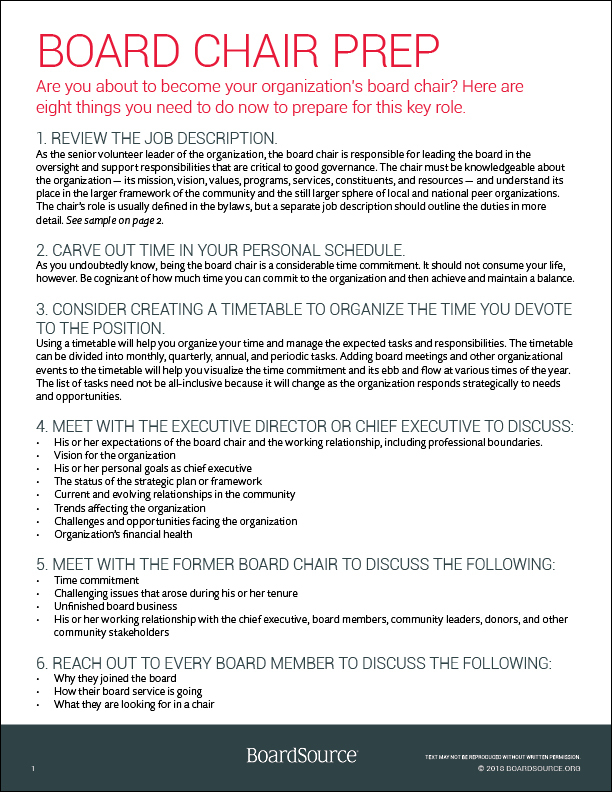 Are you interested in becoming a board member of a nonprofit organization but don’t know how to go about it? Here are some practical steps to finding and contacting an appropriate nonprofit, and how to prepare yourself for the commitment. 101| Community resource. 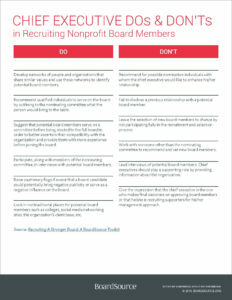 People have countless reasons for wanting to become nonprofit board members. Most individuals have well-informed, honorable intentions, and with guidance, they have the potential to have fulfilling board experiences. But occasionally, motivations are misinformed, wholly self-serving, or simply not constructive. 201| Members only resource. Nepotism — the practice of showing favoritism toward relatives — usually falls under the purview of management when hiring practices come under scrutiny and supervisory relationships are challenged. Governance can also become a victim of nepotism when family members or close relatives work or serve together. 201| Members only resource. 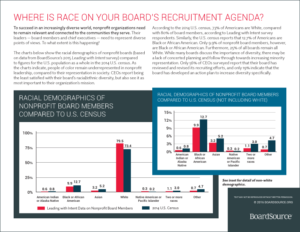 Most nonprofit boards understand the potential benefits of board diversity and inclusion, yet many struggle to fulfill the promise offered. Why is that? We mean well, after all. Are there hidden barriers to achieving this promise? 101| Community resource. If you are considering board service, do your due diligence. Learn as much as you can about the organization beforehand. Ask questions about the following. 101| Community resource. This sample is intended to provide you with a template for developing your board postings and is designed for use with LinkedIn Board Connect. Please customize it to meet your needs. 201| Members only resource. If an organization grows as hoped and planned for, a “working board” will eventually reach a point when it’s time to transfer the organization’s management, administration, and operations to staff and staff-led volunteers. 101| Community resource. 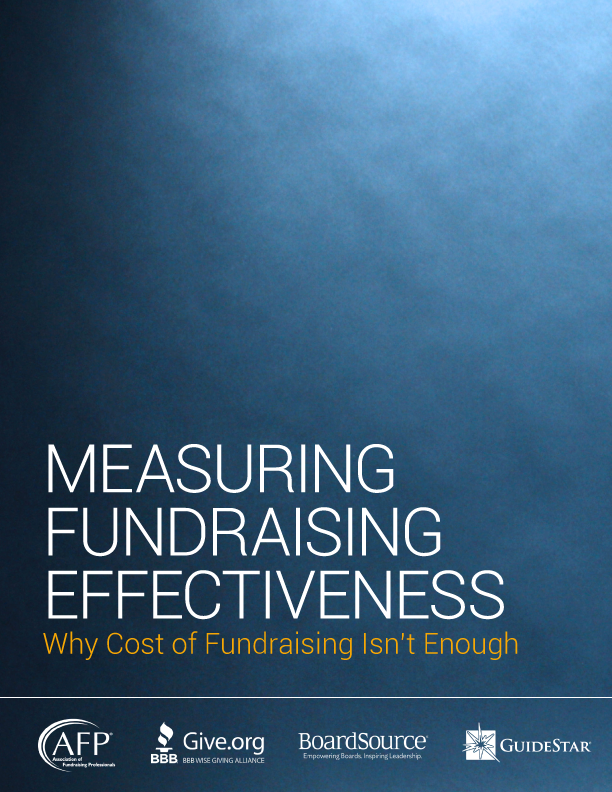 Different nonprofits will have different expectations of board members based on their size, mission, or particular challenges. 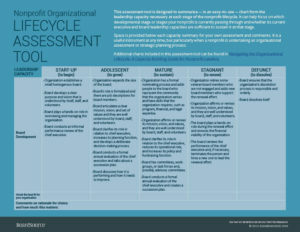 Understanding what an organization needs will help you match your motives, interests, time commitments, and personal goals to that organization so that you can make a valuable contribution. 201| Members only resource. More and more boards are dedicating time and effort to create youth partnerships. They are finding the youth perspective to be helpful, enlightening, and a functional asset. There are also some challenges for making it work. Study the benefits and challenges of youth board service to decide if this is appropriate for your organization. For the purposes of this paper, youth, young people or minors are defined as age 20 and under.